Indian Army officers are the most amazingly easy people to get along with. Should you fall in love with one and decide to marry him, here is what you can expect from them.. He will be extremely respectful to your parents and your family. He may not understand why your brother has long hair or sleeps late, but he will try to understand...because he loves you. However, there will be indirect hints about getting up at 0500 hrs (it's never 5 am) and doing 5 km with 100 push ups. And how a crew cut is the most fashionable hairstyle ever. Going to a party is a parade. 2000 hrs means 1955 hrs. Right time, right kit (dress) and right place. Your husband may be a young captain but when you enter a room, all officers will get up to wish you...and that includes Generals too. That is the level of respect you can expect...every time. If he is out for work and you are alone, expect EXTRA attention from the Unit ladies. You didn't marry just him...you married the army. He will be extremely loving and understanding, but you have to understand that to him "Roger" is as romantic as "Yes, honey". Expect Young Officers (YOs) to land up at your house at odd hours demanding food. It won't happen frequently, but by God it will happen. Scrambled eggs are acceptable food. The youngsters will offer to help. Decline gracefully. Army YOs are like good natured rhinos in a bone china shop. If you are sitting alone in a party (your husband is cracking jokes with his friends which NO ONE outside the fauji circle understands), expect a YO to ask you for a dance. It's tradition and speaks of good breeding. When he meets your school and college friends, he will very polite with the ladies. He will open doors and pull chairs. Chivalry is in his DNA. He is NOT flirting. That's just the way he has been trained. 9. He is not walking on your left hand side. He is 9 o'clock to you. The building is not in front...its 12 o'clock. He will eat rice with a fork, unless it's a sit down dinner. If it's rotis he is eating, he will use the fork to push the dal or veggie to the roti. That's just how all officers eat. He will eat at a dhaba if you so desire, but will maintain fauji table manners. He will "open" and "close" his plate. If he uses a toothpick, he will cover his mouth with the other hand. He will drink but never get drunk. His manners will always be impeccable. Guderian, Rommel and Clausewitz are not his coursemates. If he is with his coursemates, don't expect him to behave his age. They are the only competition you have in terms of attention. He does not want to know what happened at the Ladies Club. Poor man has suffered enough. He will respect you for being strong. And he will be happy for you to take centerstage, with him cheering you from the sidelines....goofy grin and all. Though it depends on the ethnicity of the troops that he commands, don't be surprised if you are called "Sir" sometimes. No disrespect is meant. He is probably the most secure man you have ever seen. He will have very little self doubt. All the ribbons that he wears on his chest are the reason. He will never use foul language in the presence of ladies. This is not to say that his "grammar" is not up to the mark. On the contrary, he probably has a PhD in "language". But NEVER in the presence of ladies. While he will have enough for you to be comfortable, he is never going to be rich. But if you count your wealth in an extended family of a million warriors, tons of love, respect and loyalty...well ma'am you have married a guy richer than Bill Gates. 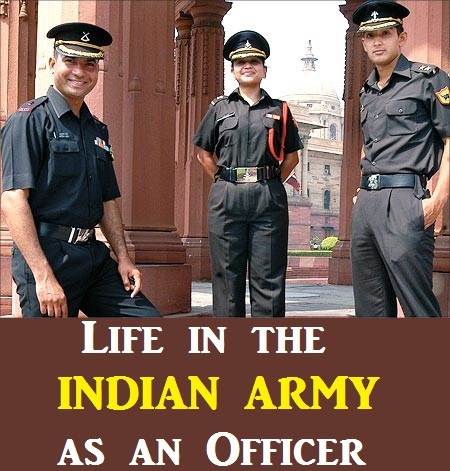 So this was all about Life in the INDIAN ARMY as an Officer. Our intention to share this article with you was only to inspire you towards your goals for joining armed forces. Surely this article will help you to motivate and work hard on your Goals. Jai Hind.. Vande Matram !! !